My boys were so excited when I told them Sodastream was coming. I really don't think they have ever been so excited about any product I have reviewed in the past. The day that the giant box arrived on our doorstep, they were dragging it inside and ripping it open before I even knew what was going on. We received the Jet to review. I will admit, I was a little leary at first. I love my soda (pop around these parts lol), and I really didn't think I would be happy with anything we could make at home. Add to that the fact that I only drink diet soda, and I was pretty much sure that the Sodastream would be a disappointment. I. was. wrong. It was so easy! You attach the carbonator to the Sodastream machine. You just simply screw it in. No wires, no cords, no batteries. There ya go, you have carbonation. Then you fill the provided water bottles (I guess they are actually soda bottles, aren't they?) with cold water. You put them onto the Sodastream and push the button on top to release carbonation into the water. Three pushes of the button, and you have carbonated water. And then comes the fun. You add the flavoring syrup. What kind of soda would you like? There are over 30 sodamix flavors to choose from, and they are a great value. It evens out to around $0.25 for a 12-ounce can of soda! There is literally any flavor you can think of : Cola, Diet Cola, Lemon Lime (Sprite), Fountain Mist (Mt. Dew), Cherry Cola, Orange, Root Beer, and many, many more! We tried the Root Beer and the Orange Soda first. We were very impressed with them both, and with how easy the Sodastream was to use! The only thing we noticed when using our Sodastream, is that sometimes, especially with the darker sodas, you might want to put an extra fizz or two of carbonation in. Something about the darker sodas needed a little extra carbonation. I liked the fact that the soda tasted so fresh. I really had never tried anything like it. And, me, being me, especially liked the fact of how cheap it was to make that much soda! And then my hubby discovered something that will change his life. FOREVER. This is Sodastream's Energy Drink Flavor. And it tastes exactly like Red Bull. My husband is obsessed with Red Bull. I mean really, we are talking like at least $5.00 a day in energy drinks for him. So, he finds the Energy Drink flavor mix, and he is like so excited I thought he was going to pee himself! I honestly couldn't believe it, but he loves it. He says it tastes exactly like Red Bull, and he is going to start drinking it and taking it to work instead of stopping and buying it on his way! 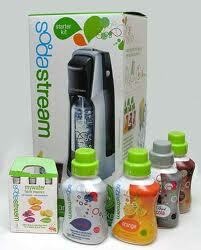 So, thanks Sodastream, for helping my husband save money! I am definitely a big fan of the Sodastream at-home soda maker, and I am very excited to add this little gadget to our home appliances. 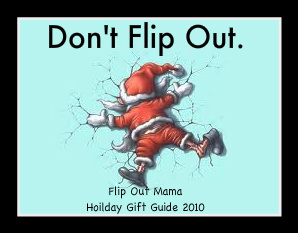 I think this would make a great gift. I would love to get one of these for my niece and nephew. They are "soda crazy", and I think they would really get a kick out of making whatever kind they wanted with the Sodastream. 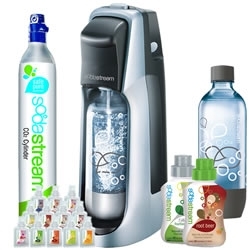 You can order Sodastream online, or find it in a store near you, like Macy's, Sears, or Bed, Bath and Beyond. Thanks, Sodastream, for letting me review this awesome product! I received a sample product in order to conduct this review. Although a review product was received, all opinions are my own, and no monetary compensation was given. Is that Sodastream thingy really a new product overseas (okay, six weeks ago, but still!)? In good old Germany we had that Sodastream hype about 7 years ago, everybody had one (or one of the alternative products, there are many others to choose from and the discounters offer cheap, compatible syrups, too). It may not be representative, but people around me stopped using that in the past years, preferring non-bubbly-drinks (guess it's some kind of fashion) and getting a little annoyed by having to prepare a drink first. However, I got my Sodastream back from it's storage and it's in use again - still producing perfect cola and all the fancy new low-calories-little-color-intense-taste-beverages, after 7 years! Definitely the best 30€ I've ever spent.